Oh HELL no, I did not let another month go by without posting! Criminey!! It’s Wednesday afternoon, just a couple of days before Christmas, and all is quiet at Poudre Studio Artists & Gallery at Poudre River Arts Center. Only one other artist is working in her studio and the gallery has had a few visitors, giving me plenty of time to work. I’m doing two pieces for our February show, “Interiors.” One is an ode to the Barbie Townhouse I never had and the other is an ode to all of the shorehouses I’ve stayed in during my visits to the Jersey shore.They are coming along really well and I’m getting pretty excited about them. This photo is a part of the shorehouse shrine and I call it “beer on the half shell”. 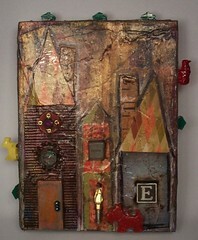 The show was inspired by the book Mixed Media Dollhouses by Tally Oliveau and Julie Molina. When I was a child, I always loved making things for my dolls; I had a dollhouse in progress when my friend Eliza showed me the book. We all talked about it here at the center and naturally, we organized a show! There is still time to enter your work in “Interiors”, if you have a mind to. You do not need to be a Colorado resident in order to join in the fun. You may have already-completed pieces that fit the theme and that are dying for a new audience. Ever have a piece that you just hated no matter what you did to it? This chipboard tag (along with another, slightly larger one) was one of those pieces. 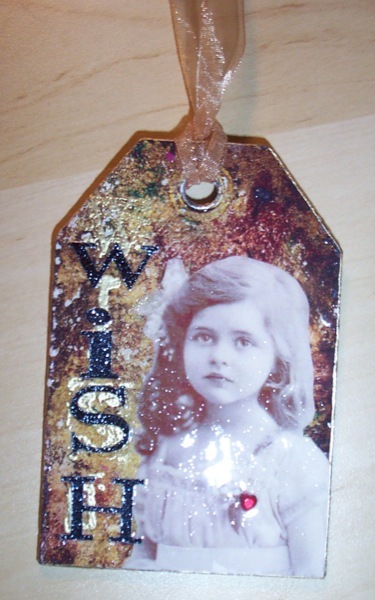 When I finally got a paint job on the tag that I actually liked, I let it sit in a box on my table for months before I got over my fear to do something with it. When I had an idea, it all came together in a flash and it is now an ornament for our Christmas tree. My favorite part is the delicious Diamond Glaze coating. I’m going to be a woman of few words today. I finally finished these canvases I started in Leighanna Light’s class a few weeks ago. I love them! It was fun to take whatever scraps and randomness I had on the table in front of me to create these little rows of houses. 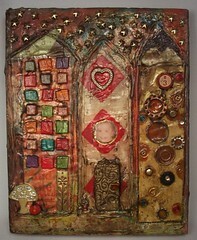 I loved “frosting” the canvases with gel medium to create texture. Thanks, Leighanna, for a great workshop! I have more creativity, art and art project books than you can shake a stick at. I realized recently that I have lost track of what books I’ve read and more importantly, what books actually move me and do their intended job of inspiring my creativity. This thought came to me as I was reading one of my Christmas presents from mom: Jane Wynn’s Altered Curiosities. It really struck me on a number of levels — as an artist, a writer and as a former editor. As a result, I’ve decided to write reviews of these books, starting with the most recently acquired. 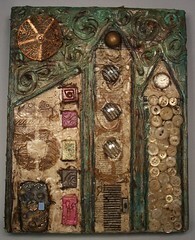 Read my review of Jane Wynn’s Altered Curiosities: Assemblage Techniques and Projects here.